This was easily the best place that we stayed on our entire trip. We stayed in 5 locations over 10 days. It was everything we expected and the view from the home was amazing! The hot tub was a very nice bonus especially towards the end of our travels. Beautiful and tastefully appointed mini mansion in an incredible location. Luxurious bed, fully equipped kitchen and a clean and modern bathroom. Multiple outdoor living areas to make the most of the absolutely gorgeous views of surrounding olive groves, the town and the sea beyond. Friendly and warm welcome from the host George made us feel right at home including preheating the spa/jacuzzi so we could really soak in the sunset even though it was early February. Do you self a favour and book a stay here you will not regret it! Don't miss staying at this beautiful place. From the outside the the three units are built like traditional two-story Greek houses set in lovely hillside grounds. Inside the houses are beautifully renovated. The upper stories have a hot tub with a view of the water. The owner is super helpful. The British couple, who are managers, are wonderful! A short walk to town. What can I say...this place was wonderful. Our hosts were incredibly friendly and welcoming. We only stayed one night, but honestly wish we could've stayed a while longer. The accommodations exceeded expectations with a nice kitchen, multiple private porches, and a hot tub! Goergous house in a peaceful location with stunning views of the bay. 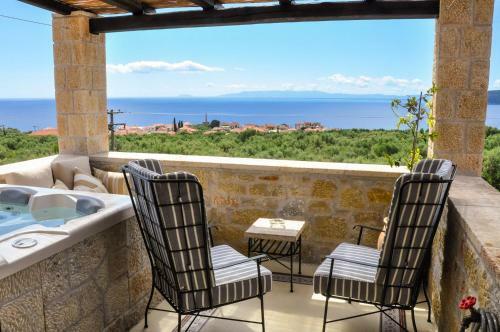 Fully equipped, confortable and inviting to stay in to enjoy the views of the ocean and the olive tree garden. Decorated with great taste, it just is the best place to relax after a hike or day at fhe beach. The outdoor hot tub is a great addition. Ruth, the manager, is a great lady who made out stay even more enjoyable. Outstanding service. Lovely private terrace with comfortable seating and a dining table - with views down to the sea. Great hot tub on upstairs balcony. An easy walk into town for shops, bars and restaurants. Lovely bedroom with comfy bed. An excellent set of self-catering units set high above Kardimili. Lovely views over to the sea with well-tended gardens and spacious balcony. The fittings were of a high standard with eveything you need for a stay. This is a lovely spacious apartment with a downstairs kitchen area, bathroom with a good, hot shower and a large covered terrace overlooking Kardamyli and the sea. The terrace has very nice lounge chairs. Upstairs a very comfortable and cosy bedroom and a deck with a Jacuzzi! The kitchen has all the equipment and more. complimentary olive oil and vinegar. We were welcomed by our host who had already turned up the airco to warm the house. The Jacuzzi was heated to 36 C and ready to use (February). The host is very friendly and helpful to all our needs. The house is also well equipped with everything we need. We had a wonderful stay at Polismata, even if it rained a lot in chilly winter days. We loved the little fireplace, the Jacuzzi, and the kitchen utensils. Everything is pretty and clean. Highly recommend it if you want to spend a relaxing holiday in Peloponnese. We'll definitely choose to stay here again next time we go there. Lock in a great price for Polismata – rated 9.7 by recent guests! Just a 3-minute drive from Kardamili beach, Polismata offers self-catered accommodations over 70 m2. Featuring a balcony overlooking the Messenian Bay, each one comes with an outdoor hot tub. Free WiFi is also available. Polismata air-conditioned maisonettes and villas include a fully-equipped kitchen with a stove, a fridge and a microwave. All units have 2 LCD satellite TVs with USB and an iPod docking station. Featuring tiled and wooden floors, each offers a private bathroom with slippers and free toiletries, and a living room area. Kardamili is located 22 mi away of Kalamata. Guests can explore the surrounding area, by using the free mountain bikes offered by the property. The little Meropi Island is located only 1,150 feet from Kardamili Port, while the famous Diros Cave is around an-hour driving from the complex. Free parking is available nearby. When would you like to stay at Polismata? -private bathroom with slippers, hairdryer and free toiletries. Please note that this room type may also feature 2 double beds and 1 single bed. Polismata is located in Kardamili, 350 meters from the main road. The location of Polismata is characterized by stunning views of the Messinian Bay, enchanting sunsets and rich aroma of the olive groves. 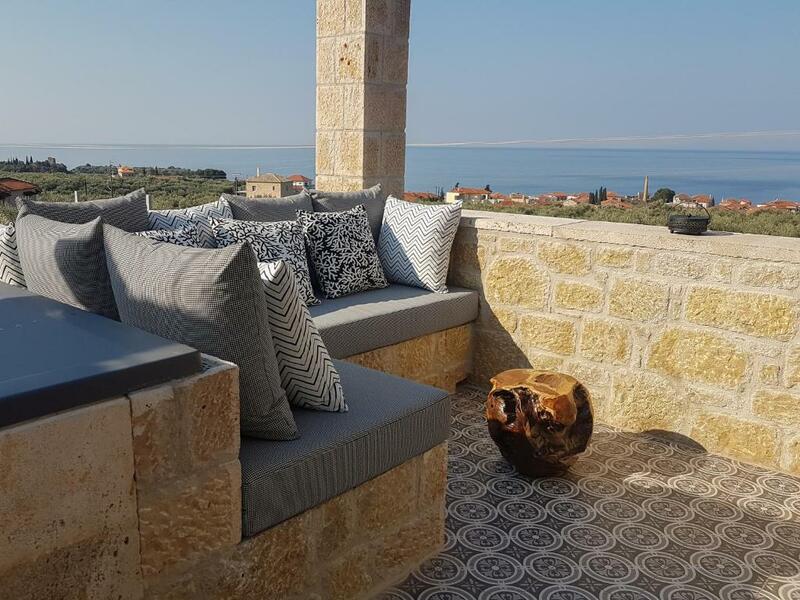 Our desire was to create a beautiful and comfortable place, where tradition, nature and modern comforts are harmoniously embraced, a place where every visitor can spend a relaxing and quiet holiday in an extremely breathtaking landscape. In the times of Homer, Polismata was the name for the small kingdoms. Four of them were Zarnata, Lefktro, Oria and Passava from which the stone maisonette-villas of the complex were named. 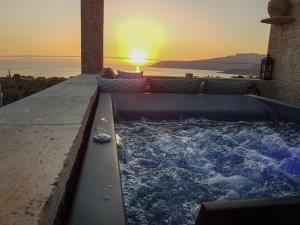 All villas have a private Jacuzzi and can accommodate up to 5 people. We look forward to welcoming you to our villas and we wish you a memorable stay. House Rules Polismata takes special requests – add in the next step! Polismata accepts these cards and reserves the right to temporarily hold an amount prior to arrival. Please note that this property does not offer any breakfast. Please inform Polismata of your expected arrival time in advance. You can use the Special Requests box when booking, or contact the property directly using the contact details in your confirmation. The only thing I would have liked to have is a washer to do some laundry. We had no idea which unit we were staying in, there was no reception and we found our rooms because the cleaner happened to be there. The only negative is that it's not closer to the shoreline....but the views!